Also see accident for Boston, Mass. – July 4, 1892 under Massachusetts Civil Aviation Accidents on this website for more information about Professor Rogers. Source: New York Times, “Three Balloon Accidents” July 5, 1892. On July 4, 1879, Aeronaut George A. Rogers and four companions, Baldwin, Kater, Bradley, and Donahue, made a balloon ascension from the Boston Common. The balloon then drifted eastward, passing over Faneuil Hall, then over part of Boston Harbor, and then over East Boston, Winthrop, and towards the open sea. Not wanting to be pushed out to sea, a drag rope and grappling hook were thrown out. Unfortunately, the grappling hook broke as soon as it hit the ground, and there was nobody in the vicinity to grab the drag rope. Before long the men found themselves out over the open water, and as they were passing Deer Island they encountered a “pop-up” thunder shower. The heavy rains pelted the balloon and caused it to abruptly drop towards the water. Off in the distance crewmen aboard the steamer, Samuel L. Little, and the tug boat, Camilla, saw the plight of the aeronauts and each gave chase. 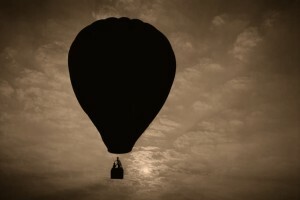 Meanwhile, the sloop-yacht, Magic, was heading inbound returning to Boston, and its crew saw the balloon being blown seaward in their general direction. The Magic’s commander, Captain, Edward C. Neal, set an interception course and within a few minutes was able to throw a line to the balloon which was now very low to the water and six miles at sea. The line was secured, and Captain Neal ordered a small boat into the water to be rowed directly under the balloon. As this was being done, strong winds were buffeting the balloon, causing it to twist and sway while tugging on the rope. Professor Rogers climbed into the hoop of the balloon to direct rescue operations and open the release valve, while Bradley climbed into the netting ready to grab any other lines that might be tossed. Meanwhile, Kater and Donahue were pulling sandbags of ballast from the bottom of the gondola and throwing them into the sea. Then without warning, Baldwin was suddenly pitched from the basket, but managed to grab hold of the outside and hang on. Then the rope leading to the Magic suddenly snapped and the jerk of the balloon that followed caused Baldwin to lose his grip and fall into the water. Fortunately by this time the Samuel L. Little had arrived on scene and managed to secure the balloon’s drag rope, thus preventing it from being blown away, however, as the drag rope became taunt it pulled Bradley from the netting and sent him falling. As luck would have it he landed squarely in the small boat that had been launched from the Magic. Although badly bruised, Bradley was able to assist in rescuing Baldwin from the water. Fortunately he was quickly rescued. Now that the balloon had been relieved of the weight of two occupants, it suddenly shot upwards as far as the drag rope secured to the Samuel L. Little would allow. As the balloon bobbed a few hundred feet in the air, Rogers managed to open the emergency valve and release some of the gas to escape from the balloon. As the balloon dropped back towards the water, Rogers and the others were taken aboard the Samuel L. Little. The balloon was also salvaged from the water and brought aboard the steamer. As a point of fact, this had been Professor Rogers 38th ascension.